The picture is a bit misleading, from the way it looks I thought it would be the length of a body pillow, my fault for not reading the full description. I'm not a huge fan of the case only because it doesnt seem to fit the pillow right, it's too baggy and the pillow edges don't really fill it out. The case is very soft though which is nice. Although I'm unable to use the pillow how I had originally intended to, about 20 minutes after laying it out my dogs found it and fell in love. We are actually considering buying a second because they are constantly fighting over who gets to sleep in the pillow. This comfort reading pillow has two separate sections to support your back. 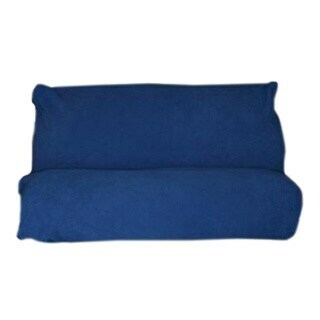 Available in several color options and crafted of quality microfiber, this pillow is both attractive and long lasting. The bottom portion of this innovative pillow is designed to support your lower back while you rest your head and shoulders on the upper portion. You'll never struggle again with our Reading in Bed Pillow. A natural cotton shell surrounds the filling in two perfect-sized sections. Our pillow offers two levels of lumbar support. Whether you're reading watching TV or doing homework, this pillow provides the perfect way to sit comfortably in bed. From now you will be able to sleep the way you deserve and you must feel very lucky to have arrived at the right place. 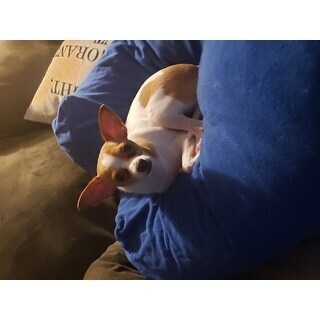 Love this pillow. I have slept better than I have in a long time. Versatile too...can use to sit up in bed and read or watch tv. Also, I wake up with less pain in my neck using this with one regular pillow for sleeping. Love this pillow it is easier to read a book in bed! It is very comfortable. For the price I would have though it would be better, The cover isn.t that great and I don't know how long the pillow will last. If it does it would be 4 stars. meh. too expensive for what they do. i mean its okay... but you can do better. Comfy for reading. Recommend for students especially! "The dimensions are listed as 9.4 inches by 9.4 inches...this hardly seems large enough to use as a bed prop pillow for sitting up in bed???? Is this an error in the description or is it only the size of a throw pillow?"